On February 24- 25 took place in Brussels, Belgium, the CITIA (Conversational Interaction Technology Innovation Alliance) Roadmap Conference, supported by European Project ROCKIT. All the presentations are available on demand. In other words, around 100 research scientists and industry representatives in the domain of speech recogition gathered during two days to discuss the future of speech recognition research in Europe. Share the first version of the Roadmap for Conversational Interaction Technologies produced by the ROCKIT project and collect critical feedback on its content. ROCKIT European project develops a research and innovation agenda including a strategic roadmap in the area of natural conversational interaction and has arrived to a first version of the roadmap after the first year of the project. The 2-days conference programme enabled the exchange of ideas and networking among all stakeholders of the European Conversational Interaction Technologies ecosystem, among which SMEs (including Klewel!) and corporations, universities and research institutes European institutions, specialized media. 1st scenario – Adaptable interface for all, with a presentation by Prof Hervé Bourlard from the Idiap research institute in Switzerland. 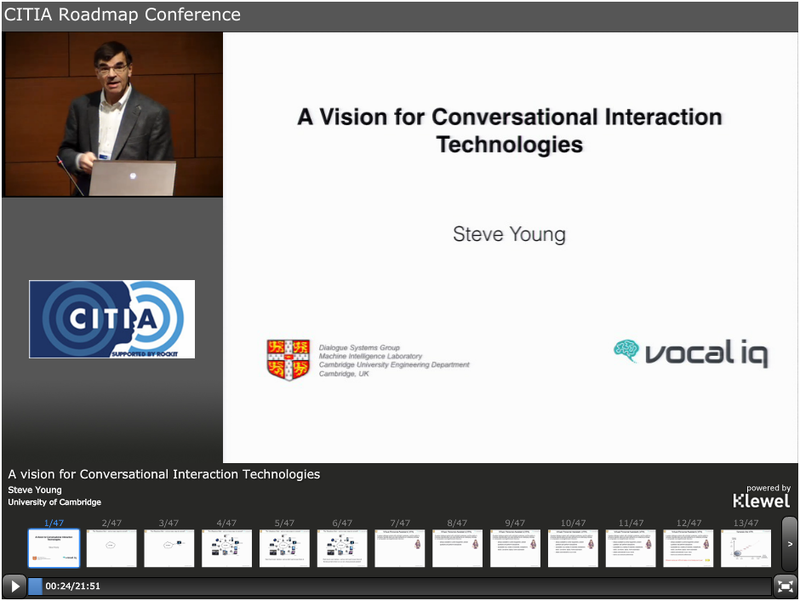 4th scenario – Communicative robots with a presentation from Sylvain Calinon from Idiap. 5th scenario – Shared collaboration and creativity with a presentation by Jean Carletta from the University of Edinburgh. This session featured the drivers for enriched shared collaboration, including translating and augmented videoconferencing, design and creative collaborations, and multiplayer games. In this session, I made a talk about the vision of Klewel for the future. Steve Renals from the University of Edinburgh concluded with a recap of the 2-day event. For more information on CITIA please visit: http://www.lt-innovate.eu/citia. If you also would like your event to be webcasted on demand, simply contact us or give us a call +41 27 722 43 42.